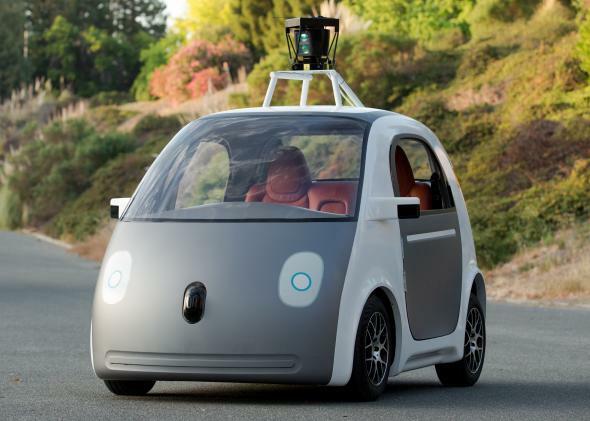 Detroit vs. Google: Self-driving cars and the innovator’s dilemma. Google’s latest self-driving car prototype doesn’t even have a steering wheel. The American automotive industry isn’t as resistant to innovation as it once was. But Detroit’s big three automakers have their cost structures to deal with, their reputations to think about, and (lately) their profits to protect. So anything too risky is going to be a hard sell. It doesn’t get much more risky than a technology that would turn cars into robots and end driving as we know it. In one meeting, both sides were enthusiastic about the futuristic technology, yet it soon became clear that they would not be working together. The Internet search company and the automaker disagreed on almost every point, from car capabilities and time needed to get it to market to extent of collaboration. It was as if the two were “talking a different language,” recalls one person who was present. That’s an apt metaphor. Detroit automakers speak the language of established industry leaders, trafficking in terms like profit margins, brand image, and liability. Google, despite its size, still deals in the conceptual vocabulary of a tech startup: blank slates, prototypes, moonshots—and, yes, disruption. Clayton Christensen’s shopworn theory has its limitations, but it’s not a bad lens through which to view the sort of bind in which Google’s self-driving car technology could place companies like Ford, GM, and Chrysler. Unlike classic examples of disruptive technologies, self-driving cars are likely to be more expensive than human-driven versions, at least initially. But the long-term vision of the self-driving car involves moving from an ownership model to a service model, in which large numbers of people simply call cars whenever they want them. One Google patent even suggests that retailers could offer potential customers a free ride to their store in exchange for bombarding them with ads. That implies an existential threat to Detroit’s entire business model, from production to marketing to distribution and sales. If Detroit automakers were certain that this were the future, they would have little choice but to begin preparing, even at great cost to their existing businesses. If your platform is burning, it’s better to jump ship than go down with it. The catch is that it’s far too early to tell whether Google’s radical vision of a driverless society will catch on. It would be rash, bordering on suicidal, for a company like Ford to invest heavily in fully driverless technology today only to see the market—or regulators—reject it tomorrow. Instead, the automakers are looking to Google and other tech companies for incremental improvements to their existing products, like in-car technology, crash-avoidance systems, or automated parallel parking. But Google has become increasingly convinced that such half-measures are a poor substitute for fully autonomous driving technology. The more you’re forced to rely on the human behind the wheel, the fewer benefits you derive from self-driving software. Only when every car is automated will a crash-free (not to mention hands-free) world be possible. That, of course, is anathema to an industry built on near-universal car ownership and romantic images of the relationship between car, driver, and road. It would also threaten to reduce the automakers to mere hardware manufacturers—the Motorolas and Foxconns of the transportation industry. Building dumb chassis and drivetrains for Google’s smart cars is not GM’s idea of a bright future. That’s the crux of the dilemma. Google has little to lose and much to gain from driverless car technology. For automakers, the equation is just the opposite. Such a misalignment of interests makes mutually beneficial cooperation very difficult for both sides, even when they need each other. In the end, Google will likely need to find a partner with less to lose if it’s going to bring its self-driving cars to market. Reuters mentions Tesla as a possibility. It’s an intriguing idea, particularly since CEO Elon Musk has indicated that he aims to be an early mover in autonomous driving. But the timeframe for mainstream adoption of fully self-driving technology is likely to be measured in decades, not years. Right now, even Tesla probably can’t afford to think that far out. The company has more pressing problems trying to crack the internal-combustion infrastructure monopology. In any case, Musk has stated his preference for “autopilot” technology that lets the driver take over when needed. For now, Google is rumored to be working with specialty automotive engineering firm Roush Enterprises, best known for its racing endeavors. Roush is in fact based in the Detroit area, even if it’s not the first name that comes to mind when you think of Detroit. But it seems unlikely to become a mass-production auto manufacturer anytime soon. Another alternative, floated recently by industry consultant Edward Niedermeyer, might be a large-scale automotive supplier like Continental or Magna. None of which means that the big three—or their overseas counterparts—can rest easy. The implied threat from Google will force them to accelerate their own assisted-driving efforts to show customers that they don’t need to hand over the keys in order to reap the benefits of the robo-driving revolution. In the long run, their best bet is to hope that fully autonomous cars turn out to be less like Google search or Gmail and more like another Google moonshot that looks poised to fall significantly short of the moon: Google Glass. Google’s New Self-Driving Car Looks Like a Koala. Or Totoro.